For measurements of gas exchange between terrain and the atmosphere, LI-COR eddy covariance solutions combine precision instrument platforms, flux computation systems, and powerful new post-processing software that deliver ecosystem insights faster than ever before. Taking you from raw data to publishable results, fully-integrated LI-COR systems streamline the research process, empowering researchers of all skill levels with access to advanced ecosystem-level gas exchange methods. Gather the highest quality data with rapid, precise, and highly-configurable digital instruments chosen as the global standard. Get real-time observations with fully-processed flux calculations effortlessly delivered with flexible data transfer options. Gain ecosystem insights and get to publication faster with automated post-processing tools integrated for the first time into an intuitive user interface. 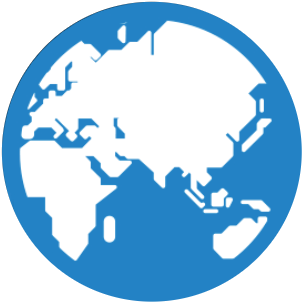 Gather data confidently with the precision gas analyzers and instrument platforms that have been chosen as the global standard by top flux networks like Ameriflux, Asiaflux, Chinaflux, CERN, CARN, ICOS, and NEON. High-speed LI-COR digital gas analyzers have the lowest power requirements of any analyzers on the market and accommodate a variety of sonic anemometers and mounting structures to deliver proven performance and consistently reliable gas exchange data. LI-COR eddy covariance analyzers have the lowest cost configuration and power requirements among similar instruments. Featuring miniaturized electronics and simplified hardware, the newly-redesigned LI-7500DS Open Path CO2/H2O Analyzer requires only 4 watts of power during normal operation – lower than any other EC gas analyzer available – making the analyzer ideal for deployment in remote areas where power is limited. Figure 1. An object that is too close to the sonic anemometer—whether it is a tree branch, a tower support, or a gas analyzer—can cause flow distortion and lead to measurement errors. Colocation is not practical because gas analyzers and anemometers have physical components that can disrupt the turbulent air flow. Disruptions to turbulent flow from large objects near the sample volume are difficult to detect, and virtually impossible to correct, without data from a second anemometer on the same tower. (6, 7, 8, 9) To date, there are no published equations to correct for this issue. 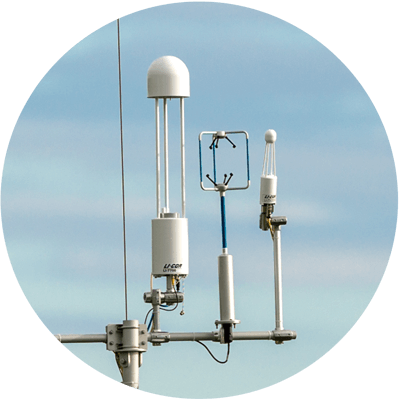 An ideal eddy covariance system will provide collocated measurements of wind speed and gas densities with no bulk that affects turbulent air flow. To facilitate the optimal analyzer position, LI-COR instrument platforms use a mounting solution that positions the gas analyzer at an appropriate distance from the sonic anemometer(s). This mounting apparatus makes it easy to determine separation distances and to orient the eddy covariance system toward the prevailing wind for an ideal omnidirectional setup. LI-COR non-dispersive infrared (NDIR) gas analyzers provide consistently accurate gas concentration measurements over a full temperature range. The open path LI 7500DS and LI-7700 and enclosed path LI 7200RS analyzers are designed to be used in challenging outdoor environments, where they are subject to large temperature extremes. Key optical components are actively temperature regulated, and electronics are designed to be stable over a wide range of temperatures. The typical performance of LI-COR gas analyzers over a range of temperatures and CO2 densities is shown below. Due to careful optical and electronic design, the performance of LI-COR analyzers is consistent with theoretical expectations. Full calibration details are also provided with every instrument. CO2 calibration curves for an LI‑7500RS gas analyzer at 6 temperatures. The relationship between CO2 density and absorption is consistent across the full temperature range of -24 to 44 °C. Wyngaard, J. C., 1981. The effects of probe-induced flow distortion on atmospheric turbulence measurements. Journal of Applied Meteorology, 20: 784-794. Wyngaard, J. C., 1988. Flow-distortion effects on scalar flux measurements in the surface layer: Implications for sensor design. In Hicks, B. B. (Eds) Topics in Micrometeorology. A Festschrift for Arch Dyer. Springer, Dordrecht. Frank, J. M., W. J. Massman, and B. E. Ewers, 2013. Underestimates of sensible heat flux due to vertical velocity measurement errors in non-orthogonal sonic anemometers. Agricultural and Forest Meteorology, 171-172: 72-81. Horst, T. W., S. R. Semmer, and G. Maclean, 2015. Correction of a non-orthogonal, three-component sonic anemometer for flow distortion by transducer shadowing. Boundary-Layer Meteorology, 155 (3): 371-395. Frank, J. M., W. J. Massman, E. Swiatek, H. A. Zimmerman, and B. E. Ewers, 2016. All sonic anemometers need to correct for transducer and structural shadowing in their velocity measurements. Journal of Atmospheric and Oceanic Technology, 33(1): 149-167. Huq, S., F. De Roo, T. Foken, M. Mauder, 2017. Evaluation of probe-induced flow distortion of Campbell CSAT3 sonic anemometers by numerical simulation. Boundary-Layer Meteorology, 165(1): 9-28. Horst, T. W., R. Vogt, and S. P. Oncley, 2016. Measurements of flow distortion within the IRGASON integrated sonic anemometer and CO2/H2O gas analyzer. Boundary-Layer Meteorology, 160(1): 1-15. Dyer, A. J., 1981. Flow distortion by supporting structures. Boundary-Layer Meteorology, 20(2): 243-251. Grare, L., L. Lenain, and W. K. Melville, 2016. The influence of wind direction on Campbell Scientific CSAT3 and Gill R3-50 sonic anemometer measurements. Journal of Atmospheric and Oceanic Technology, 33(11): 2477-2497. 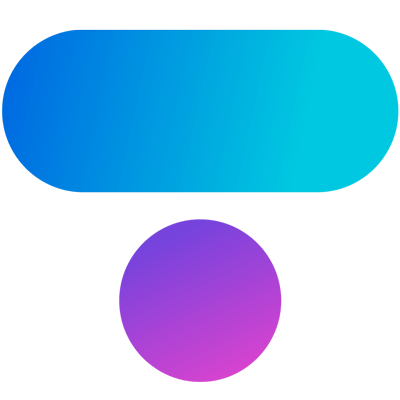 Get real-time insights into your data with fully-processed fluxes on demand. 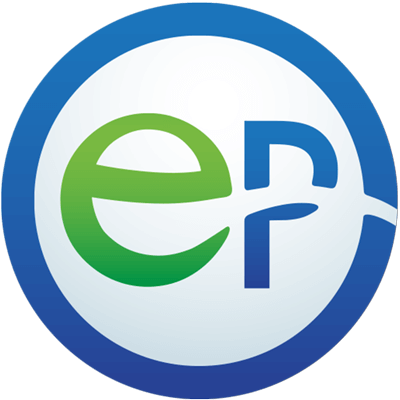 Along with LI-COR instruments, EddyPro has been widely adopted by researchers and networks around the world, including the Integrated Carbon Observatory System (ICOS), the Chinese Ecosystem Research Network (CERN), Ameriflux, and many others. Easy configuration and use with a simple graphical user interface. Complete set of processing options, including frequency response correction, random error estimation, and quality flagging. Standardized computation routines used by leading flux networks. Seamless processing of LI-COR .ghg files and support for other file types. Integrated online help, videos, and technical support. SmartFlux is the on-site processing and GPS synchronization component of LI-COR eddy covariance systems. The SmartFlux system uses EddyPro to provide fully processed flux results in real time using raw data from a LI-COR gas analyzer and a sonic anemometer. Flexible data transfer options like automatic file transfer to a network server or private repository accommodate your existing setup. 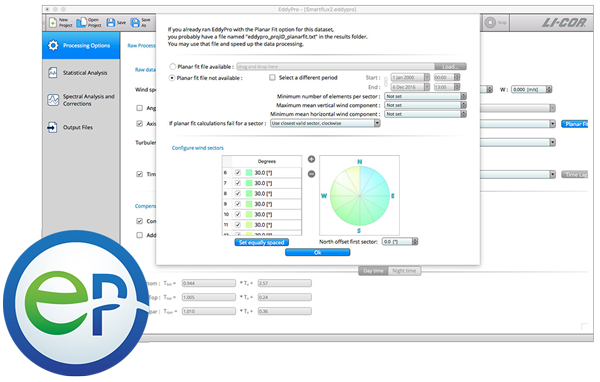 View and download real-time final fluxes, processed by EddyPro software on the SmartFlux system, on your smartphone, tablet, or computer. FluxSuite is a secure web service that shows fluxes, biomet data, and status information from your site. Get to ecosystem insights faster and more reliably than ever before. 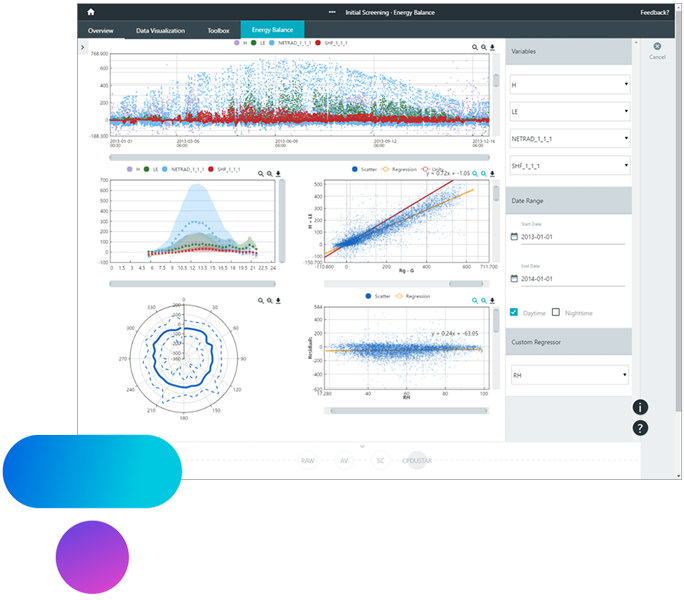 Tovi integrates powerful and widely-accepted post processing methods into a sleek, intuitive graphical user interface that provides the highest quality, publishable eddy covariance results. For the first time, QA/QC, Footprint Modeling, Flux Gap Filling, U* Threshold detection, and a variety of other features are automated in a graphical user interface. By eliminating manual calculations, Tovi will help you get to your results quicker, get onto new projects sooner, and get more done in a grant cycle. Tovi integrates widely accepted and cited post-processing calculations and algorithms into a single software package. By standardizing and automating complex calculations, Tovi allows you to be confident that your analysis is performed correctly and consistently each and every time. Export comprehensive reports containing complete documentation of your analysis, results, and citations, providing transparency for reproducible results. Tovi provides any level of researcher with a complete, scientifically-sound analysis platform for eddy covariance data. New students and seasoned lab members alike can get straight to work utilizing advanced post-processing techniques. Tovi also has a unique programming notebook feature that provides extensibility to more advanced researchers. With a complete LI-COR system, you can be certain that your observations accurately reflect genuine differences in ecosystem-level gas exchange properties and that your results can be reliably interpreted. Submit your manuscript with confidence knowing that bias is not introduced by using other non-standard instruments or processing methods. Designed and manufactured by LI-COR, the Data Acquisition Module and Data Retention Module make it easier than ever to log your biological and meteorological data. Want a faster way to analyze your eddy covariance datasets? Introducing Tovi™ – a powerful new data analysis software package. Can you believe it runs on only 4 watts? The LI-7500DS has the lowest power requirements of any EC gas analyzer available.